Ever since there have been a number of rushed and misleading media reports wrongly suggesting that this two-thirds conservative majority can proceed to dismantle and bulldoze all the structures of the Bolivarian state, including the very government led by the elected President Nicolas Maduro. One publication nonchalantly asserted that a "supermajority" would allow the opposition to begin the process of appointing and dismissing Supreme Court judges and convene a convention to rewrite the constitution." ("The coming confrontation",The Economist, Jan 16th 2016.) 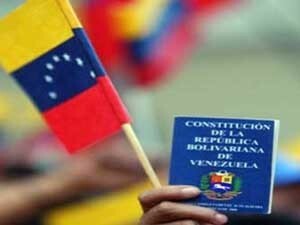 These assertions may be true but only under very specific constitutional conditions which we seek to explain here, for as long as the 1999 Bolivarian Constitution remains Venezuela's key instrument that informs the legal and constitutional parameters within which any structural change must take place. The constitutional provision that may allow the Right to force the resignation of President Maduro is the recall referendum (Art.72). They already resorted to a recall referendum against Hugo Chavez in August 2004 the then President who won with 59%. The constitution stipulates that it can be forced only once during the term and when half the mandate of the elected official - the President of the Republic in this case - has elapsed. Anybody can force a recall referendum against the President of the Republic provided 20% of the registered voters (which at present is about 4 million) support it. The elected official's mandate will be deemed to be revoked "when a number of voters equal to or greater than the number of those who elected the official vote in favour of revocation, provided that a number of voters equal to or greater than 25% of the total number of registered voters have voted in the revocation election, [...] and immediate action shall be taken to fill the permanent vacancy in accordance with the provided for in this Constitution and by law." (Art.72) . (The Constitution of Venezuela is the only one in the world with the constitutional right to recall any elected official once half their mandate has elapsed; it applies to Mayors, MPs, Governors, and the President of the Republic.) Half of President Maduro's mandate will elapse in April 2016, and thus a recall referendum, if it takes place, will be between April and June 2016. Were the opposition to collect enough signatures a recall referendum can be successful only if the number of votes against President Maduro is identical to or higher than the number of votes he obtained when elected President in April 2013, that is, 7,587,579 votes. At the 6th December 2015 elections to the National Assembly the Right got 7,707,322 votes, which represents a small increase from their results at the April 2013 presidential election when their candidate, Henrique Capriles, got 7,363,980 votes, that is 343,342 more votes, barely an increase of 4.22%. At the 6th December 2015 election, the government got 5,622,844 votes. This, when compared to the 2013 presidential election, shows that about 2 million Chavista voters, disgusted with the economic situation, punished the government by abstaining. The 6th December election results for the opposition can be accounted to a large extent by their political capitalization on the terrible economic situation Venezuelans have been facing since the unleashing of the economic war. The ousting of the Maduro government was not on their electoral manifesto, thus they may find it difficult to turn the totality of the 6th Dec. 7,707,322 voters into votes to recall President Maduro in a referendum. Thus, a recall referendum may or may not be forced this year but if held, it is not a foregone conclusion that the opposition will win it. But if the opposition wins it, this will force presidential elections, which, if the opposition won them as well, the Right will launch a full-on assault on all the social gains made since Hugo Chavez was elected in 1998. Additionally, they can: •	Decide that a vote of no confidence in the Vice President or cabinet Ministers should lead to their dismissal, and subsequently dismiss them •	Authorize presidential decrees allowing expanded executive authority (known as "enabling laws") •	Appoint members of the National Electoral Council •	Remove members of the National Electoral Council, provided it is backed by a ruling by the Supreme Court (For the above they need a qualified majority of 3/5 of the National Assembly - 101 members). The list above has been widely publicised by sections of the world media, but its reporting has been skewed so as to convey that the end of the Bolivarian Revolution is in sight but especially that the demise of the Maduro government is imminent. However, most reports have failed to provide the broader legal and constitutional framework within which legislative initiatives aimed at dismantling the Maduro-led government can take place and what constitutional pre-requisites they must fulfil if they are to succeed. Below, we explain how the Constitution of the Bolivarian Republic of Venezuela of 1999 provides the broader legal and constitutional framework within which such dismantling can occur. To be constitutional and legal, each one of the possible initiatives listed above that a right wing National Assembly majority can take, must be consistent with the spirit and the letter of the Bolivarian Constitution of 1999, approved by national referendum with over 70% support. Any initiative can be forwarded by either the President of the Republic or by any MP to the Supreme Court for the latter to issue a ruling on its constitutionality. Thus, for example, the constitutionality of any legal initiative to privatise health (Art.84), education (Arts.102 and 103), or existing state enterprise or state institution, or any part thereof, can constitutionally be contested through asking the Supreme Court to issue a ruling on the matter. The same applies to amnesties and other political initiatives, such as votes of no confidence in the President, Vice-President, cabinet ministers and so forth. Justices of the Supreme Tribunal of Justice may be removed by the National Assembly by a qualified two-thirds majority of the members, after granting the interested party a hearing; in cases involving serious misconduct already characterized as such by the Citizen Power, on such terms as may be established by law. (Art.265). "Citizen Power is exercised by the Republican Ethics Council, consisting of the Ombudsman, the General Prosecutor and the General Comptroller of the Republic." (Art.273). Citizen Power is an independent body charged with ensuring probity in the activities of public officials and organs and can instigate investigations and punishment of actions that undermine public ethics and administrative morals (Art.273-283). to rule as to whether or not there are grounds for impeaching the Vice President of the Republic; members of the National Assembly or the Supreme Tribunal of Justice itself, Ministers; the Public Prosecutor; General Prosecutor; General Comptroller of the Republic; the People Defender; Governors; general officers and naval admirals of the National Armed Forces; or the heads of Venezuelan diplomatic missions. Additionally, the President of the Republic has the right (Art.214) to return for reconsideration or amendment any legislative initiative taken by the National Assembly, and if the National Assembly insists, he has the obligation to either promulgate it or he can send it to the Supreme Court for ruling on its constitutionality. The same applies to National Assembly proposals to reduce presidential terms. Besides, there is the popular referendum (Art.71) to decide on matters of national importance that can be called by the President of the Republic, the National Assembly by a simple majority, or by the request of 10% of registered voters, known as Consultative Referenda. Identical requirements exist for the Abrogative Referendum (Art.74), which can be undertaken in order to abrogate or rescind a law. Herman Escarrá, probably Venezuela's most prestigious constitutionalist expert, recently asserted that there are robust constitutional and legal mechanisms to ensure that the Right in the National Assembly is unable to use its overwhelming majority to carry out unconstitutional acts, with the Supreme Court, the Public Prosecutor, and Citizen Power being the key to this. There is no state organ of public power that can undertake any kind of action that cannot be subjected to constitutional scrutiny in Bolivarian Venezuela. Thus Escarrá concluded, "there is democratic governance in Venezuela". However, this will only be so from now if the opposition operate and act within the Constitution's parameters. Unfortunately, with their overriding objective to overthrow the government, over the last 17 years, Venezuela's Right, with the support of Washington, have respected the rules of the game only when it suits them but have broken them when it does not. The new President of the National Assembly, an old regime politician who, upon taking over, promised "to get rid of the Maduro government in six months." Thus, there are huge and many political battles ahead in Venezuela. The huge Right Wing majority in Venezuela's National Assembly has been mistakenly interpreted as having the constitutional power to dismantle the whole Bolivarian institutional and constitutional edifice that has been built over the last 17 years. This can be accomplished only if (a) it forces and wins a recall referendum against President Maduro, and/or, (b) it convenes a Constituent Assembly, which will involve the election of MPs to the Assembly, for which it will need to win a majority and start the whole process from scratch. The constitutional and political issues discussed above - and the legitimacy and constitutionality of legislative initiatives undertaken by the conservative majority in Venezuela's National Assembly - will be thrown into sharp relief when and if, following their deeply neo-liberal convictions, they seek to water down, undermine, reverse, or abolish any of the highly progressive gains of Chavismo since 1998, such as free and universal health care and education, good quality affordable housing, national control over the nation's natural resources, and so forth.